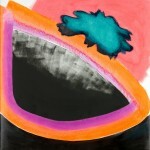 EffeArte is proud to announce the second solo show by the Los Angeles based painter Monique van Genderen. While her large scale paintings and wall installations are two dimensional the artist takes her work into the three dimensional realm by creating experimental objects such as benches, books and end tables into which she has seamlessly hidden her hand bound books of watercolors within the angles and surfaces of the structure. Through various idioms and the context of the installation van Genderen explores form, color and texture and continues her vigorous inquiry into image making. With contradictions in scale, material, and traditional techniques van Genderen’s interventions contribute to the ambiguities and current cultural perceptions of painting practice. In her most recent work van Genderen has chosen clay as her material. Using ceramic as the ground and glazes as her pigments she utilizes one material to examine another focusing on the intersection between crisis and possibility. Her primal instinct to create transforms ideas into objects, culminating in compositions that are at once gestural and forthright. For this exhibition van Genderen’s latest body of ceramic paintings will be exhibited in the gallery in addition to paintings produced on traditional canvas. The completed canvases will be stretched on site to promote a fresh sense of composition and mimic the element of surprise that happens in the kiln when the glaze is fired to the clay. The artist chose this method to celebrate less order, increase risk, loosen any boundaries on creativity and foreground the alchemy of science and chemistry present in both modes of production.